Lawrence teacher Josh Blaisdell officiates NCAA D-III national title game. Lacrosse is growing in Maine. It’s growing around the entire country, actually, and Josh Blaisdell is in the middle of it. More players means more of everything is needed, included officials. That’s where Blaisdell is working to expand the game. A lacrosse official for the last 10 years, Blaisdell will spend part of his summer training the next generation of referees. He’s a member of the officials association’s national training committee, and when school is complete in a few weeks, he’ll go to Vail, Colorado to train officials. Then, he’ll be in Portland, Oregon to do the same. Essentially, Blaisdell is preparing his replacements, and he couldn’t be happier to do so. Last weekend, Blaisdell officiated the NCAA Division III men’s national championship game at Gillette Stadium in Foxboro, Massachusetts, between Salisbury State and the Rochester Institute of Technology (Salisbury took a 15-7 win). Blaisdell estimated he worked 30 college games this season, including the NCAA Division I opening round game between Monmouth and Bryant. This all started for Blaisdell 10 years ago, when Scott Walker — now the athletic director at Morse High School in Bath — told Blaisdell about the shortage in lacrosse officials. At the time, Blaisdell was an assistant coach with the Lawrence football team in the fall and the head coach of the Lawrence ice hockey team in the winter. He was looking for something to do in the spring. Blaisdell grew up playing lacrosse in Kennebunk and played at Springfield College, where he was a goalie. Officiating the game seemed to be a natural fit, right? 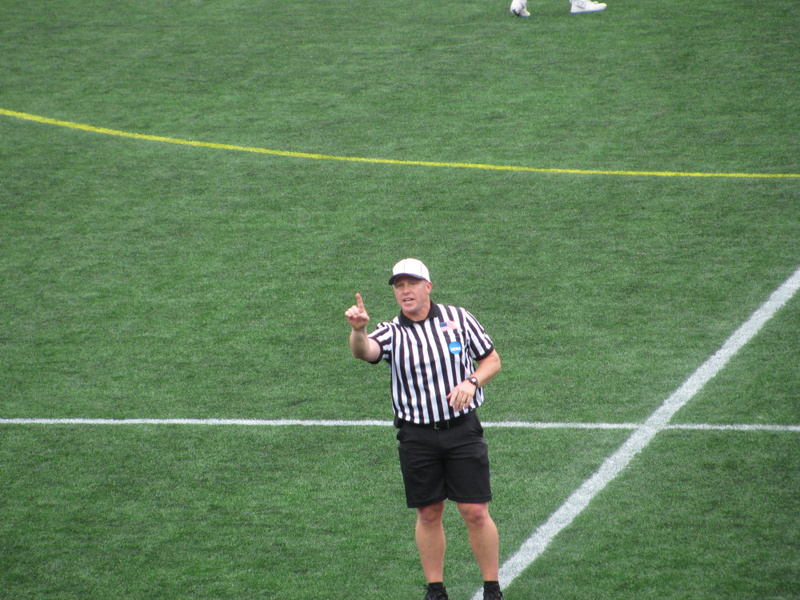 Somebody who knows lacrosse as well as Blaisdell would be sure to be an excellent referee, right? “At first, I was awful,” Blaisdell said. There was a game early in his officiating career in which Blaisdell was instructed by his veteran partner to only make calls on out of bounds plays. Blaisdell took criticism as it was intended, to be constructive and make him a better official. Lacrosse is a fast game. Blaisdell had to learn to process information quickly and trust what he was seeing. Blaisdell knew the rules. He knew what constituted a penalty. Now, he had to learn to ask himself, was there an advantage gained? Do I call that? “There’s being able to understand the black and white rulebook, but officiate the game,” Blaisdell said. About three years ago, with countless games on his resume, Blaisdell finally began to feel completely comfortable on the field. “Anything could happen in a game, and I’d knew I could fix it,” Blaisdell said. The NCAA championships had a prominent Maine presence. Mark McInnis, a southern Maine-based official, worked the Division I men’s championship game, a 9-6 win for Maryland over Ohio State. The Buckeyes are coached by Nick Myers, who, like Blaisdell, is a Kennebunk High School graduate. Blaisdell gave up coaching football and hockey a few years ago to focus year-round on lacrosse officiating. He still keeps involved with coaching by helping the girls and boys lacrosse teams at Lawrence. While he misses coaching, he is happy to help grow lacrosse by ensuring that players have well-trained, competent officials on the field alongside them.